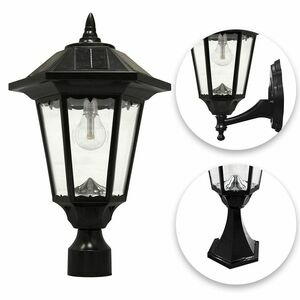 The Windsor Bulb Solar Light - With Pole, Post & Wall Mount Kit in Black is composed of a rust-resistant cast-aluminum build, which features the attractive design of a 19th-century lamp. With a bright output of 150 lumens, the Windsor Bulb is the perfect option for residential homes. • Dusk-to-Dawn Automatic Operation: This solar powered outdoor light will turn on automatically once the sun goes down and will turn off when the sun comes up. If the panels aren�t getting enough direct sun to charge the battery to capacity, switch LED-brightness mode to economy mode to extend the nightly light duration. • No electrical wiring required: It requires no electrical wiring for installation, making it the perfect replacement for outdated electric or gas-powered outdoor lighting. • Specialized Illumination: Convenient high/economy brightness mode switch provides specialized illumination that on a full charge shines up to 15 hours on the economy setting and up to 8 hours on the high setting. • Durable and Weather Resistant: Beyond providing a superior combination of light brightness and duration, Gama Sonic solar light fixtures are known for their physical durability. The monocrystalline solar panel is protected by weather-resistant, cleanable tempered glass that helps ensure long-lasting reliability. • 3 Inch Fitter: The Windsor Solar Lamp comes with a 3-inch fitter attachment that will fit on any existing 3-inch outside diameter lamp post (Post Sold Separately). • Wall Mount: Allows the lamp to be mounted to any vertical surface such as a wall, fence, or column.